Mortality risk for 15 027 subjects: interaction between age at enlistment and percentage of company killed. The 95% confidence interval for the third quartile for those 17 years and younger was 1.06 ≤ 1.15 ≤ 1.24; and for those 18 years and older, 0.94 ≤ 0.99 ≤ 1.05. The 95% confidence interval for the fourth quartile for those 17 years and younger was 1.04 ≤ 1.11 ≤ 1.18; and for those 18 years and older, 0.95 ≤ 0.99 ≤ 1.05. The asterisk indicates P < .05. Background Hundreds of thousands of soldiers face exposure to combat during wars across the globe. The health effects of traumatic war experiences have not been adequately assessed across the lifetime of these veterans. Objective To identify the role of traumatic war experiences in predicting postwar nervous and physical disease and mortality using archival data from military and medical records of veterans from the Civil War. Design An archival examination of military and medical records of Civil War veterans was conducted. Degree of trauma experienced (prisoner-of-war experience, percentage of company killed, being wounded, and early age at enlistment), signs of lifetime physician-diagnosed disease, and age at death were recorded. Setting and Participants The US Pension Board surgeons conducted standardized medical examinations of Civil War veterans over their postwar lifetimes. Military records of 17 700 Civil War veterans were matched to postwar medical records. Main Outcome Measures Signs of physician-diagnosed disease, including cardiac, gastrointestinal, and nervous disease; number of unique ailments within each disease; and mortality. Results Military trauma was related to signs of disease and mortality. A greater percentage of company killed was associated with signs of postwar cardiac and gastrointestinal disease (incidence risk ratio [IRR], 1.34; P < .02), comorbid nervous and physical disease (IRR, 1.51; P < .005), and more unique ailments within each disease (IRR, 1.14; P < .005). Younger soldiers (<18 years), compared with older enlistees (>30 years), showed a higher mortality risk (hazard ratio, 1.52), signs of comorbid nervous and physical disease (IRR, 1.93), and more unique ailments within each disease (IRR, 1.32) (P < .005 for all), controlling for time lived and other covariates. Conclusions Greater exposure to death of military comrades and younger exposure to war trauma were associated with increased signs of physician-diagnosed cardiac, gastrointestinal, and nervous disease and more unique disease ailments across the life of Civil War veterans. Physiological mechanisms by which trauma might result in disease are discussed. War is particularly traumatic for soldiers because it often involves intimate violence, including witnessing death through direct combat, viewing the enemy before or after killing him, and watching friends and comrades die.1 Heavy combat exposure, seeing comrades injured, witnessing death, and prisoner-of-war (POW) experience are traumatic beyond the time spent in military service or other military events.2,3 Young adults exposed to military combat may also be at greater risk than their older peers. Vietnam veterans who were 19 years or younger during the war were significantly more likely to have substance abuse problems, criminal activity, employment difficulties, and problems with social relationships after discharge,4 and long-term distress and mental health symptoms are higher among Vietnam veterans who entered military service at a younger age (R.C.S., E. A. Holman, FNP, PhD, N. A. Hawkins, PhD, and J. M. Butler, PhD, unpublished data, 2005). Many investigators5-9 have examined the mental health consequences of exposure to war trauma and found substantial postwar psychiatric difficulties among veterans. 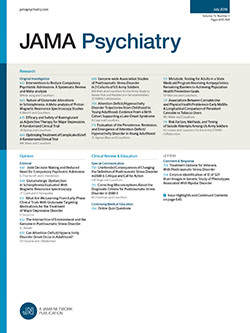 Research has also linked war trauma and physical health outcomes,10 including an increase in negative physical symptom reporting,11-14 chronic illness, and death.11,15 Traumatic war exposure has also been linked to specific self-reported and objective health problems, such as cardiovascular disease and hypertension5,16-19 and gastrointestinal (GI) disorders.7,20,21 Nevertheless, although literature detailing patterns of physical health problems among aging veterans has grown,22 there has been a heavy reliance on self-report measures of either military trauma7,11,13,21,23-25 or health.5,11-14,17-20,23-25 While some researchers26 have examined military and medical records on a small sample of servicemen, their aim has been to examine clusters of postwar syndromes rather than link multiple traumas with specific physical disease states. To this point, there has been no examination of the health effects of multiple war traumas using well-documented military service records and objective health data over veterans' lifetimes. During the Civil War, soldiers were particularly vulnerable to intimate violence. Family members and friends were often assigned to the same company of around 100 men, who were not replaced as they died. When companies experienced substantial losses, survivors were left with few remaining friends or male family members.31 Soldiers readily identified with the enemy (who were sometimes from the same state or county), making the sight of mutilated corpses even more gruesome.1 Although guns and cannons were used, frontal assault was common, and hand-to-hand combat, with no trenches or barriers, resulted in row after row of dead bodies and the sight of comrades blown apart.31 Unlike in other documented wars, young adolescents and older men were allowed entry into military service (ranging from those <10 years to those >70 years).31 Overall, the Civil War qualifies as one of the bloodiest in US history, exposing thousands to incomparable traumatic experiences.31,32 If intimate violence is particularly detrimental, increased exposure to such violence should consistently predict negative health outcomes. There is great interest in the Civil War. The National Archives in Washington, DC, which house the original military and medical records, report that the Civil War is the most researched and written about war in all of history. The present study examines the relationship between traumatic war exposure and health outcomes directly using objective health and trauma data collected from a sample of Union Army Civil War veterans with the goal of parsing the effects of various war experiences on health. We hypothesized that severity of traumatic war exposure (eg, greater exposure to death and younger age at entry) would predict signs of 3 physician-documented diseases that have been linked theoretically and empirically to traumatic life experiences (cardiac, GI, and mental health disorders)10 and more unique ailments across a veteran's postwar lifetime. Data were collected as part of an effort to amass the largest, most comprehensive collection of electronic Civil War data files transcribed from their original written records. This project, Early Indicators of Later Work Levels, Disease, and Death, is sponsored by the National Institutes of Health and the National Science Foundation.33 Of 20 000 possible companies from the Descriptive Roll books at the National Archives, 303 companies of Union Army recruits were randomly selected. Military service records and pension file information were sought on every recruit in each company, resulting in a final sample of 35 730. The government went to great lengths to ensure the validity and precision of military records.34 Pension files contain postwar medical records and standardized physical examinations until the recruit's death (called Surgeon's Certificates), completed by government physicians certifying the veteran's health and disability status.35 Those recruits who died during the war or deserted did not generate a Surgeon's Certificate.35 Thus, not all recruits' military files could be linked to their medical records. Of the sample of 35 730 recruits, 17 700 participants were linked, and among these, veterans with complete data on key study variables were selected for analyses (n = 16 200). Most excluded cases (n = 1442) were missing age at death, a crucial study variable that necessitated their exclusion. Consistent with pension law, the sample is further restricted to the 15 027 recruits who lived until 1890 or later, when physicians could diagnose non–service-connected disease. Before 1890, physicians only diagnosed service-connected illness and wounds to avoid paying pensions for conditions unrelated to military service. Recruits who died before 1890 were slightly older at enlistment (φ2 = 0.02, P < .005). Effect sizes (φ2) for the remaining study variables, although statistically significant, were extremely small, ranging from 0.03% for POW status to 0.8% for enlistment year. Statistical models fit to the full (16 200) and reduced (15 027) samples were comparable, and inferential conclusions remain unchanged. All recruits were examined by physicians and screened for health problems before entering military service. Many volunteer servicemen were rejected from military duty because of illness, physical disabilities, body size, and other unclassified problems, suggesting a healthy baseline sample (S. E. Wilson, PhD, unpublished data, 1993). One hypothesis might be that recruits who enlisted early in the war were healthier, more robust volunteers than those who enlisted later in the war effort. Also, early volunteers may have faced more rigorous health screening than recruits who entered during later years, when the draft made service unavoidable. An indicator variable reflecting early (1860-1861) vs later (1862-1864) enlistment was created as a rough proxy for baseline health status and to control for the possibility of differential health screening over time. The Early Indicators of Later Work Levels, Disease, and Death project researchers developed their own data collection software designed for entering information available from data sources housed at the National Archives. The sources of data included military records, which contained detailed accounts of military service, including enlistment and discharge dates, age at enlistment, geographic location of company, and many other variables; and pension files, which contained birth information, number of self-reported disease claims, and health records (ie, Surgeon's Certificates) after the recruit's military service was complete, among other variables. These data sets were transcribed, cleaned, and cross-referenced with each other so that the accuracy and completeness of a recruit's file would be at the highest possible level. Careful data standardization and controls were instituted to ensure quality information. Trained researchers transferred written records into a standardized computer database using automated controls, such as upper and lower bounds on fields, acceptable coded values for fields with a list of possible predetermined values, and 2-field checks; dates had to make sense (ie, no death before birth year). Medical and occupational dictionaries from the 19th and 20th centuries were available for reference by the data coders. De novo sampling was used as a quality control technique. A random sample of 5% to 10% of recruits was drawn from each company and reentered. Differences calculated between the original and de novo sample were classified as follows: incorrect entries (misread word or data entered in the wrong screen, 2.3%), omission errors (random inadvertent skipping of information, 4.0%), numerical errors (0.2%), and rating errors (skipped or misread rating when coding disease categories, 0.3%). Age at first enlistment was obtained from military records, and ranged from 9 to 71 years. Because younger age at first enlistment was predicted to be more stressful and to lead to more negative health outcomes over the lifespan, this variable was categorized into 5 age groups of approximately equal size to highlight the effect of younger ages: 9 to 17 years (n = 3013), 18 to 20 years (n = 3694), 21 to 25 years (n = 3435), 26 to 30 years (n = 2225), and 31 years and older (n = 2660). The oldest group of recruits (≥31 years) was used as the reference group in all analyses. Age at death was obtained primarily from death certificates in the veteran's file. If no death certificate was present, death date was gleaned from pension records, military notice of death records, or other correspondence. Age at death was used in continuous form as a covariate in some analyses and as an outcome in other analyses. In addition, it was stratified (9-49 years, 1; 50-64 years, 2; 65-74 years, 3; and 75-104 years, 4) to compare signs of disease across individuals in the same age cohort. The profession a recruit claimed gives a rough estimate of his socioeconomic status during the Civil War era. Six categories of professions were identified: farmers, professionals, artisans, service workers, laborers, and unproductive persons (eg, those involved in scholarly activities). Socioeconomic status was represented as a series of 5 indicator variables, with farmer serving as the reference group. History of traumatic events experienced by each recruit was gathered from military records. Traumatic exposure was operationalized as POW experience, being wounded, early age at enlistment, and the percentage of soldiers who died in a recruit's company (ie, percentage of company killed). Percentage of company killed was divided into quartiles; the lowest quartile served as the reference group. POW experience was originally cast as a 3-level variable (never, before 1864, and in 1864 or later) because of more severe conditions in POW camps later in the war effort. However, results in the latter 2 groups were the same, so they were combined for parsimony. Health history was gathered from the pension files. To receive a military pension, veterans were required to undergo a physical examination for each illness or disease claim. Thus, medical examinations were not conducted annually, but only when a new claim was presented or an adjustment in an existing claim was necessary. Every veteran underwent at least 1 examination, with a maximum of 30 examinations and a median of 4 examinations (77.6% of the veterans had ≤7 examinations). The government Pension Board required that each examination be conducted by 3 physicians who were required to come to a consensus before a diagnosis was made.36 The original medical diagnoses were entered into the Early Indicators of Later Work Levels, Disease, and Death data collection software system within disease screens. These screens were divided by organ systems and provided nonmedical data inputters a framework with which to transfer the medical data into a database. Physicians on the Early Indicators of Later Work Levels, Disease, and Death project carefully recoded the data into a classification system that corresponds to current medical diagnoses so the data can be equated to modern-day ailments. Diagnoses that were recorded include only medically reliable data. At no time in the process of data entry did the data inputters or cleaners make medical judgments. Only diagnoses representing signs of disease were examined in this study, and were selected based on indicators of abnormal chronic conditions. A veteran was classified as having signs of cardiovascular, GI, or nervous disease if he was ever diagnosed as having 1 or more ailments from the upcoming categories in his postwar lifetime. Signs of physical or nervous disease, alone or in combination, diagnosed during any examination over the recruit's postwar lifetime were coded into one 6-level categorical variable: no disease, cardiac disease only, GI disease only, cardiac and GI disease, nervous disease only, and nervous disease with cardiac and/or GI disease. Nervous disease ailments included paranoia, psychosis, hallucinations, illusions, insomnia, confusion, hysteria, memory problems, delusions, and violent behavior. In addition, many symptoms that fit within the DSM-IV37 criteria B, C, and D classification of posttraumatic stress disorder (PTSD) were diagnosed as nervous disease during the Civil War era. Nervous ailments also included other mental health problems, such as anxiety, depression, neurosis, suicidal ideation, antisocial behavior, attention deficits, hysteria, insanity, and mania, and physical ailments of the nervous system, including trouble with balance, incoordination, aphasia, paralysis, tremor, hyperesthesia, vertigo, headaches, epilepsy, and memory loss. The number of disease ailments is a count of the number of unique cardiac, GI, and nervous ailments across all medical examinations over the veteran's postwar lifetime. Each unique disease ailment was counted only once, when the veteran was first diagnosed as having the condition. Although companies were randomly sampled, individual-level data were used in this report. As such, men were considered to be clustered within companies and regression models were estimated using methods allowing for dependence among observations within clusters.38,39 The postwar lifetime presence of disease (a 6-level categorical variable) was analyzed using a maximum likelihood multinomial logistic regression; the number of unique disease ailments was analyzed using a negative binomial regression (a Poisson with overdispersion), and mortality risk was assessed using a Cox proportional hazards model. This analysis provides estimates of the risk of mortality for veterans with and without traumatic war exposure. Effect sizes (and 95% confidence intervals) are estimated using incidence risk ratios for the postwar signs of disease and the number of unique disease ailments and hazard ratios for mortality risk. All analyses were performed using Stata, version 8.0 (Stata Corp, College Station, Tex). Regression models include indicator variables representing socioeconomic status, year of enlistment, and age at death to ensure that the key study variables (trauma exposure and age at enlistment) were adjusted for these covariates. For parsimony, we use age of death as a continuous covariate in the analyses to ensure that greater health problems were not simply a result of living longer (and, thus, having a greater chance of developing health problems). Theoretically relevant interactions were screened for inclusion in the multivariable models. Specifically, interactions among key study variables were evaluated to determine whether the effect of trauma on signs of disease depended on other exposures (eg, the effect of age at enlistment might be magnified by exposure to trauma as measured by POW status, percentage of company killed, or being wounded). Interaction terms reaching the P = .05 level of significance are reported. Nonparticipants were defined as recruits who were in the total military sample and had data on predictor variables (eg, POW experience) but whose medical records could not be linked during data collection (n = 18 027). Previous analyses using this data set have established that nonparticipants were significantly more likely to be dead or deserters, so that a link between their military service and medical records after the war could not be established.33Table 1 provides a description of participants and nonparticipants using all study variables. Although there were statistically significant differences between participants and nonparticipants, standardized effect sizes (φ2) were small, ranging from .0002 for POW status to .057 for occupation. One exception was age at death; only 8623 of the nonparticipants had this information available, and this group died quite young when compared with participants (P < .005). Postwar lifetime signs of disease were available only for participants (n = 15 027). Among this sample, 5.79% had GI ailments only, 18.0% had cardiac ailments only, and 17.4% had both cardiac and GI ailments. In addition 5.1% had signs of mental disease including nervous ailments only, and 38.8% had comorbid physical and mental ailments; no signs of disease were present in 15.0% of the participants. The median number of unique cardiac, GI, and nervous ailments that a veteran was diagnosed as having over his postwar lifetime was 4.3 (minimum, 0; and maximum, 28). Table 2 describes the association between disease outcomes and the key study variables. Relative to the oldest enlistees, the youngest were more likely to be diagnosed as having signs of cardiovascular disease alone and in combination with signs of GI disease and were at greater risk of presenting with signs of comorbid physical and nervous disease. There was no association between age at enlistment and the presence of nervous disease alone. Relative to the lowest quartile of the percentage of company killed, veterans in the second quartile were at increased risk of signs of GI and cardiac disease alone. Veterans in all quartiles of company killed, relative to the lowest, were at greater risk of developing signs of comorbid GI and cardiac disease. Veterans in all quartiles of company killed, relative to the lowest, were at greater risk of developing signs of comorbid physical and nervous disease. There was no association between percentage of company killed and signs of nervous disease alone. POW experience was not associated with signs of physical or nervous disease alone, but was associated with an increased risk of comorbid physical and nervous disease. Being wounded was associated with an increased risk of nervous disease alone, a decreased risk of physical disease, and decreased signs of comorbid physical and nervous disease. There was an interaction between percentage of company killed (highest quartile relative to the lowest) and being wounded for signs of physical disease and for signs of comorbid physical and nervous disease. Among recruits who were wounded during the war, there was no association between percentage of company killed and signs of disease. In contrast, among recruits who were not wounded during the war, those in the highest quartile of company killed were at increased risk of physical disease diagnosis (incidence risk ratio, 1.33) and were at increased risk of signs of comorbid physical and nervous disease (incidence risk ratio, 1.36) (P < .03 for both). The youngest veterans at enlistment were at risk of developing more unique postwar ailments than their older peers. This pattern continues through the age of 30 years, with younger enlistees at greatest risk of being diagnosed as having more unique disease ailments when compared with older enlistees (Table 3). Relative to the lowest quartile of company killed, recruits in the upper quartiles were diagnosed as having more ailments. A POW experience was not associated with the number of unique disease ailments, and being wounded was associated with fewer unique disease ailments. Mortality risk was significantly associated with age at entry into service (Table 4). Recruits who were youngest at enlistment (<18 years) had the greatest risk for early death. This pattern continued across each age category, with younger enlistees at greater risk of early death compared with older enlistees. POW experience was associated with an increased risk of early death. There were 2 significant interactions involving age at enlistment and the percentage of company killed for the third and fourth quartiles relative to the first quartile. Among recruits who were younger than 18 years at first enlistment, having more of one's company killed was associated with an increased risk of early death (third quartile: hazard ratio, 1.15 [P < .05]; and fourth quartile: hazard ratio, 1.11 [P < .05]) (Figure). Among recruits who were 18 years or older at first enlistment, there was no association between the percentage of company killed and mortality. POW experience predicted signs of comorbid physical and nervous disease and mortality. This likely reflects the traumatic psychological effect that spending time in war camps may have had on soldiers, and bolsters our conclusion that although physical hardiness may have acted as a buffer for physical disease, it did not protect against the ill effects of war on mental health. Although self-reported disease is not the focus of this article, veterans who experienced more traumatic wartime experiences were significantly more likely to report more disease ailments. For example, POW experience, being wounded, increased percentage of company killed, and younger age at enlistment were associated with more self-reported disease ailments. Many studies1-3,6-9,12,13,23-30,42 link emotional stress, such as combat, to mental health problems. Recent literature10 on the effect of trauma on health has suggested that psychological response, specifically PTSD, mediates the relationship between trauma exposure and physical health outcomes. Unfortunately, we are unable to examine this relationship in this archival data set because we do not have clear temporal information on the development of nervous, GI, or cardiac ailments (eg, veterans may have presented with all ailments simultaneously rather than sequentially). In addition, the Civil War era preceded the recognition of a PTSD diagnosis. Researchers5,11,12,15-20,23,24,43-48 have also hypothesized mechanisms by which emotional stress is linked to physical disease. Allostatic load theory45 postulates a neurochemical response via the activation of the sympathetic nervous system and the hypothalamic-pituitary-adrenal axis in response to acute stress. Although this may be adaptive when stressors are met and resolved quickly, over periods of chronic stress these body systems can become either unable to mount an appropriate response or overly sensitive,42 overloaded by the normal cascade of stress hormones. For example, over periods of chronic stress (ie, battlefield events or witnessing death), there may be long-term cardiovascular activation that leads to elevated blood pressure and atherosclerotic development. Permanent changes in the structure and function of the stress regulatory systems are a likely mechanism leading to increased morbidity and mortality in individuals exposed to intimate violence. This study has some limitations. While these data have been carefully accumulated, coded, and analyzed, it is recognized that archival medical data, by definition, are not interchangeable with modern medical diagnoses. Because of the lack of sophistication and medical equipment during the Civil War era, diagnoses of ailments cannot be assumed to coincide with modern diagnoses of physical and mental disease. Because not all signs and symptoms of cardiovascular heart disease or PTSD were assessed, veterans are not assumed to have had these diagnoses. Nevertheless, although we are unable to construct current medical diagnoses as outcome variables using this data set, Civil War–era physicians were able to recognize and record signs of physical and mental disease that are indicative of modern diagnoses. Similar to recent studies that have found evidence of cardiovascular5,16-19 and GI20,21 disease and PTSD5-9 post war, we found that combat exposure was related to increased self-reports of negative physical symptoms and physician-diagnosed signs of cardiac disease (eg, arteriosclerosis), GI disease (eg, ulcer), and mental health problems (eg, depression). Our analysis is the first to use objective military and medical records to demonstrate the development of postwar disease ailments over the life course among veterans of any war. We found strong relations between traumatic exposure (eg, witnessing a larger percentage of company death), comorbid disease, mental health ailments, and early death. Despite the age of the data set, there have been few other opportunities to examine standardized medical examinations over a postwar period until all soldiers have died. In fact, modern data sets could not provide this kind of information. Unfortunately, it is likely that the deleterious health effects seen in a war conducted more than 130 years ago are applicable to the health and well-being of soldiers fighting wars in the 21st century, as recent studies8,14,50 have suggested. Correspondence: Roxane Cohen Silver, PhD, Department of Psychology and Social Behavior, 3340 Social Ecology II, University of California, Irvine, CA 92697-7085 (rsilver@uci.edu). Submitted for Publication: October 6, 2004; final revision received July 3, 2005; accepted July 27, 2005. Funding/Support: This study was supported by grant P01 AG10120 from the National Institutes on Aging, Bethesda, Md, as a subgrant from the Center for Population Economics at the University of Chicago, Chicago, Ill, and the National Bureau of Economics, Boston, Mass. Acknowledgment: We thank Joey Burton, MA; Dora Costa, PhD; Louis Nguyen, MD, MBA; Sven Wilson, PhD; Werner Troesken, PhD; and Chulhee Lee, PhD, for providing assistance with the Union Army archival data system.